Consequently, for the professionals who have an interest in the design, manufacture and constructional use of concrete in extreme environments the chapters in the book will be extremely useful as they describe actual experiences of concrete at the extreme limits of the unusual environments. Concrete is composed of a range of materials and by including additional chemicals concrete’s performance can be extended. Initially the designer must address the environment into which the concrete is introduced. An area of concern is where the design team is not able to access expertise of other disciplines and then may readjust their existing parameters on a predictive rather than a scientific basis. 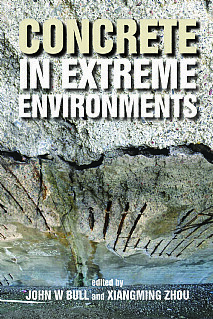 To help increase access to a range of experiences, the chapters in the book have covered areas such as recognising severe environments, construction materials failures with concrete in extreme environments, high cycle fatigue of concrete structures, in harsh environments both in design and monitoring, corrosion parameters in a buried pilot nuclear waste container, effects of extreme environments on concrete dams, models for prediction of chloride ingress in concrete exposed to de-icing salts, reactions of cements in geothermal walls and cements reactions in biogenic environments. This volume will provide a valuable tool for practising engineers, designers, contractors, researchers and advanced students in civil and structural engineering. Scientists and engineers in the associated disciplines of materials science and engineering, materials chemistry and construction will find much of interest.